Since 1995, we have steadily become the painting contractor of choice for homeowners and business owners in the eastern New Jersey and Staten Island area. Whether your need is for residential or commercial painting services (or both), we can help. We are happy to say that we provide everything you need for any kind of painting project, and our large (and growing) list of clients will confirm that. We are fully insured, and we are happy to provide references upon request – our customers will be happy to tell you about the great results they received from our service. In addition, we don’t just send a crew of guys to your location and hope they get the job done. Every paint project we perform is supervised by the owner of the company. We have a wonderful group of experienced painters, and they are trained to pay close attention to the details. That’s why all of our work is completely guaranteed – we’re proud of the finished result only when you are. After living in your home for a few years, you tend to get accustomed to seeing the same colors on the same walls each day. New paint, professionally applied, can make it seem like you are in a new home (even if it’s the same or similar color). Our customers love the difference that fresh paint brings! Like any other outdoor structure, your house is exposed to all of the elements 24/7. Not only does this cause grit and grime to build up on the surface, the sun’s radiant heat fades and degrades the paint on the outside of the house. By restoring the exterior surface and applying new primer and paint, your house will have a wonderful new look. If you own or manage any type of commercial facility, you know that painting on a regular basis is a requirement in order for it to look its best. Restaurants, offices, retail, or any other type of public building can benefit greatly from new paint, whether exterior or interior. Your building can be a big part of the first impression you make on your customers – it should be a positive one. We do a lot of skim coat work. If you have a textured ceiling, putting on a skim coat is the first step toward having a new smooth surface that’s ready for new paint. We get this part of the job done quickly and the resulting new surface looks great. If you have had a leaky pipe, or your washing machine malfunctioned and overflowed, or any other event that caused water damage to your house, we can help. This is a specialized service, and it’s not something that you should delay on – water damage only gets worse over time. We can take care of this for you professionally and efficiently. Sheetrocking is another type of job that would take a long time to do it yourself, and you most likely would not be all that happy with how it turns out. We do this all the time and get the job done the right way in a short period of time. We have a lot of customers that decide they want to paint their walls rather than have wallpaper. But taking down all that wallpaper – what a pain! Let us do it for you. We are the pros when it comes to this type of work – and you will see that when the job is done and you are looking at the final result. Let us help you – call us today to get started. Whatever kind of painting project you are considering, we can help! 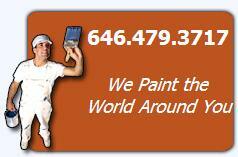 Hire our painters in Staten Island, Manhattan, Brooklyn and New York. Copyright © 2014 All rights reserved. Lenny's Painting, Inc.